With Viaero's Entertainment Trifecta Package! Get the power of FREE with the Viaero Wireless Entertainment Trifecta package! Come get a FREE big screen TV when you purchase two lines of Unlimited HD or HD Plus Service along with ProConnect high-speed internet service. 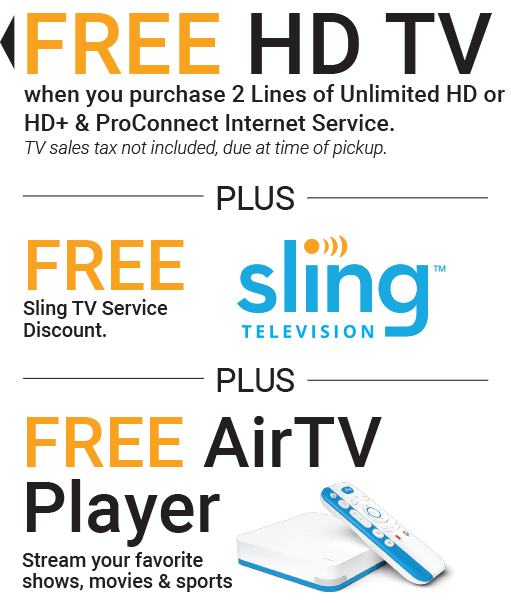 In addition to the FREE big screen TV, you’ll get FREE Sling TV service and a FREE AirTV player. * To qualify for the Viaero Free TV promotion, customer must have Viaero’s ProConnect service and two lines of Viaero Unlimited HD or HD+ service with a minimum net addition of two new lines of Viaero Unlimited HD, HD+, or ProConnect service. 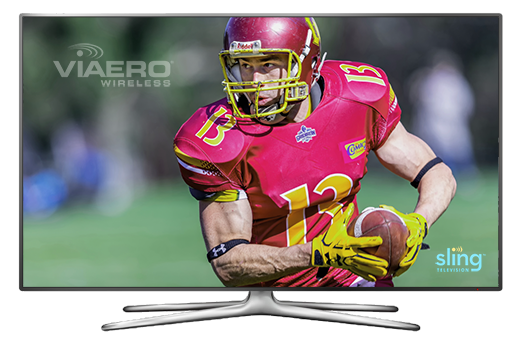 Upon receipt of promotion request form and verification of payment of the Viaero customer’s first full month’s bill, Viaero will send a large screen TV (48 inches or larger, make and model may vary) to the customer's store location for pickup (please allow 6-8 weeks for delivery). Sales taxes for the TV are due at time of pickup. A monthly charge equal to 1/24th the price of the TV and an off-setting credit will appear on the customer's bill for a period of 24 months. The un-credited balance of the TV is due upon termination of any of the new lines within 24 months. In order to receive the FREE TV, customer must agree to have their photo taken for social media purposes. This promotion may not be used in conjunction with our iPhone or Samsung BOGO offers but may be combined with the $100-off cell phone promotion. For terms and conditions applicable to service plans, visit www.viaero.com/legal.